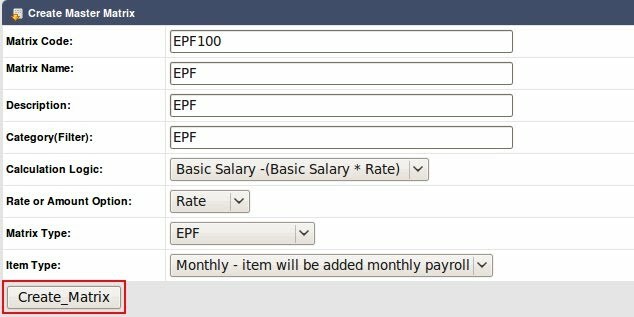 This function allows users to create the Master Matrix that will appear in the payslip, for example EPF, SOCSO, Tax, etc. Matrix Code acts like an Item Code. It is a unique code that represent each individual item in the payslip. Category (Filter) is actually a keyword field so that user can easily search for the matrix. Matrix Type is the category of the matrix. Users will be able to configure this. Monthly - matrix item that will be recurring every month. Addhoc - matrix item that only appear in the payslip occasionally. After finish inputting the details, click 'Create Matrix'. There will be additional fields that need to be filled. Description is an identifier for each Matrix Item. Range Start and Range End refer to the salary range. If the salary of an employee falls within the range, the amount or rate will be used in the selected calculation logic. Click 'Submit' to save the Matrix Item. For Payroll Allowance and Deduction, after creating the Matrix, there will be an additional field to enter the Rate/Amount. Remember to 'Update Matrix' after done. The created Matrix Item will appear in the Matrix Item List.